Education’s Top Honor Goes to Neag Professor Joseph Renzulli! At a ceremony at the New York City Library last fall, Neag Professor for Gifted Education and Talent Development Joseph Renzulli (right) is presented with the prestigious McGraw Prize in Education by Terry McGraw III, president and CEO of the McGraw Hill Publishing Company. 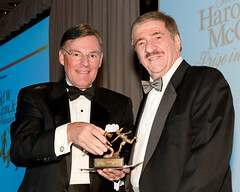 Not only is McGraw the chairman, president and chief executive officer of The McGraw-Hill Companies, he also had the pleasant task that day of informing Renzulli that his groundbreaking work in gifted and talented education had earned him the Harold W. McGraw, Jr. Prize in Education. Renzulli’s fellow honorees at the ceremony, held at the New York Public Library, were Linda Darling-Hammond, professor of education at Stanford University, and Sarita Brown, president of the not-for-profit group Excelencia in Education. That led to the creation of their Schoolwide Enrichment Model, now used in more than 2,500 schools nationwide, and to their new on-line enrichment program, Renzulli Learning, developed in connection with the UConn Research Development Corporation. The McGraw Prize, while gratifying, also offers Renzulli a bigger stage, a chance to be heard and an opportunity to further the cause of getting beyond what he calls a “dark period” in education that placed far too much emphasis on test scores.